Do you ever see a trailer for a movie that seems to come out of nowhere? An unassuming little thing that does not, on the surface, have any high aspirations?A movie that features a known actor, yet feels like it a B-side? That is what I felt with Nightcrawler. The trailers played and I was curious, but nonplussed. I cannot quite explain it, but this movie seemed mildly interesting, but it was not one that seemed to get much of a promotional push, and considering how it seemed to appear with little fanfare, I did not get all that excited about. Still, there was something alluring about it, there was something that grabbed my interest and it may have taken a few weeks, but I finally went to see it. I am glad I did. The movie was written and directed by Dan Gilroy. Gilroy is best known as a screenwriter, his career began with Freejack in 1992, seems to have peeked with The Fall in 2006, but was also involved in the enjoyable Real Steel and The Bourne Legacy. 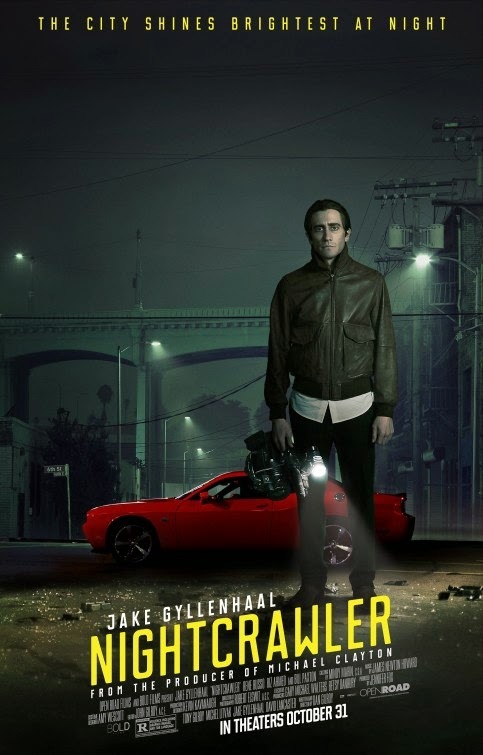 Now, he seems to have stepped up his game with Nightcrawler, it is a fascinating glimpse into the mind of a sociopath, one of the better representations of one since Christian Bale brought us Patrick Bateman in American Psycho. 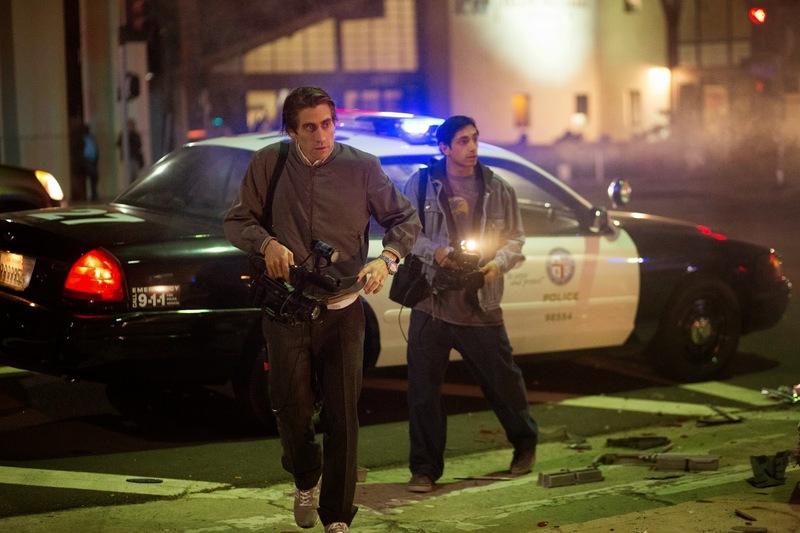 This time around we have Jake Gyllenhaal and Louis Bloom. Trust me, this dude is creepy, the scary kind of creepy. The movie opens and we see Bloom cutting chain link fencing with a set of bolt cutters. A security guard drives up, questions him, and the next thing we see is Bloom driving while wearing the guards watch. It does not take long for him to be revealed as a guy we probably don't want to know. He is a thief who will steal and sell whatever he can for a buck. Sort of. The guy is well spoken, knows how to bargain and just has the creepy aura about him. Shortly after selling some stolen goods, he is driving and comes across a car accident. He stops and looks. He watches the police rescue the woman in the car as an independent news crew rolls up to film it. Bloom listens as the newsguy (Bill Paxton) sells the footage. Bloom has an idea. Buying a police scanner and a camcorder, Bloom takes to the night streets in search of human wreckage. With some guidance from a slightly unscrupulous nes director (Rene Russo), Bloom searches for more and more carnage to film and sell. It gets to the point where Bloom is not above creating some of the news, starting by doctoring accident scenes before the police arrive. It gets worse from there. On the surface, that sounds bad, but what makes it worse is how he is as he does it. He goes about it with a complete lack of emotion, a lack of empathy, almost robot like. It is unsettling, seriously. Gyllenhaal has this way about him, that stare, the smile, the way he talks over everything, it is a performance that takes the movie to the next level. It is pretty fascinating to watch as he hires help and goes about collecting footage to sell. There is something about his sociopathic behavior that makes the movie so interesting. It reminded me a little bit of Man Bites Dog. In that film, a film crew follows a serial killer around as he does his business, it then reaches a point where the film crew begins assisting him in body disposal and murder. It is not exactly the same here, but it is just a matter of time before the man documenting the news starts to create the news, or at the very least, manipulate it. 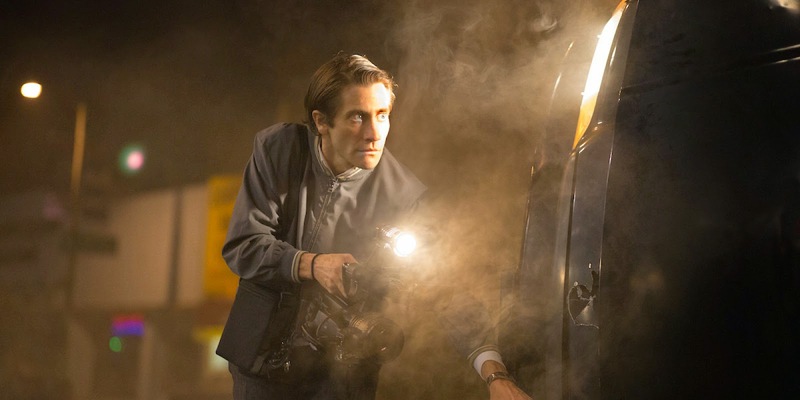 I went into Nightcrawler with very little expectations, I walked away with a smile on my face knowing I saw a legitimately good film. It is not a great one, it is not exactly deep and does not really explore Bloom's mind, but what it does do is take us into his world and makes us look at it. I think that is enough. Besides making you want to question whatever is presented as the truth, it makes you wonder about the people behind it, what is going on in their heads. 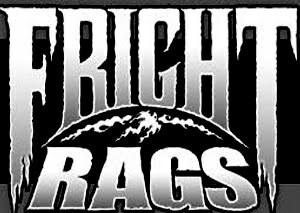 It can be pretty frightening. Bloom is pretty frightening. You also may want to rethink what you perceive as a B or lesser movie, they may hold the biggest surprises.